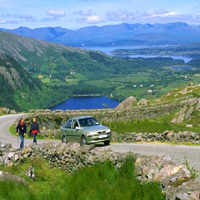 Driving Tours of Ireland offered by Caddie Tours of Vienna, Virginia. For those who like to plan their own itinerary and drive themselves. Our self-drive programs are designed to give maximum flexibility for sightseeing. You may choose open vouchers for bed & breakfast homes. Or, if you prefer the security of having prebooked accommodations, you can choose from a variety of prebooked guesthouses, hotels, castles or manor homes throughout Ireland. Your personal Ireland travel planner will assist you with creating a customized itinerary, selecting accommodations, suitable transportation, and recommending sights to see. What are the age restrictions on driving in Ireland? *Persons aged 23/24 may rent group B, & E cars for an additional charge of 25 euro per day, payable direct to the car company in Ireland. Damage excess will be in the amount of 1,000 euro. *It may be possible to rent a car to a driver over 75 but under 79 if they have a doctors certificate issued within the month prior to the rental and prove they have had no accidents in the last 5 years and are driving regularly. The proof must be produced at the Hertz Rental Desk. 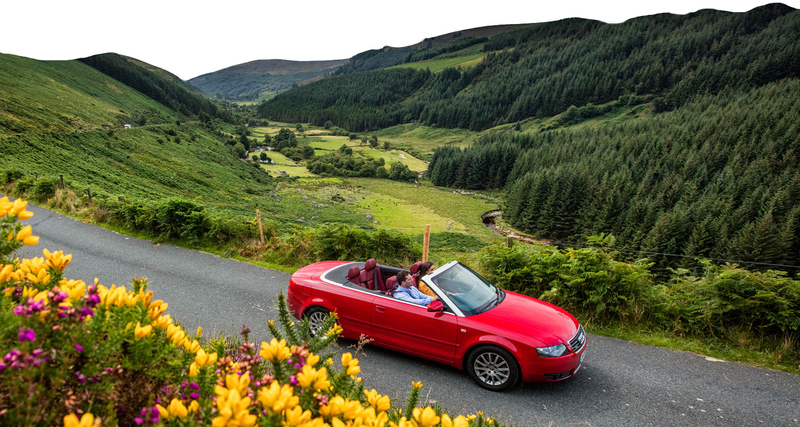 Do I need an international driver's license to drive a car in Ireland ? No international license is needed - your domestic driving license from the US or Canada is sufficient to rent a car in Ireland or Britain. You must have at least one years driving experience and their can be no endorsements on your license. Can I pick up my car in Shannon and drop it off in Dublin? You may pick up your car at Shannon, Dublin or Cork and drop it off at any one of the above locations without incurring an extra drop charge. What does my car rental include? a. By purchasing CDW through Caddie Tours at time of booking. b. By purchasing the CDW from the car rental company at the commencement of the rental period.